Today: Welcome to the dark side. Meet a coal-colored radish with a serious bite. Radishes belong to the mustard or cabbage family (along with brassicas like horseradish, broccoli rabe, cauliflower, and romanesco), and they have been around for a very long time. No, not the one you just bought -- but they are one of the oldest cultivated plants. In Roots, Diane Morgan shares that they are believed to be first cultivated “before 2000 B.C., probably in Egypt, where they were reportedly included in the daily rations, along with onions and garlic, given to the workers who built the pyramids.” It’s also rumored that this, in turn, inspired said workers to implement the first Not Sad Work Lunch. More: Short on time? Here are lunches that pack in 5 minutes or less. Keep your eye out for black radishes at the farmers market from fall into early spring. 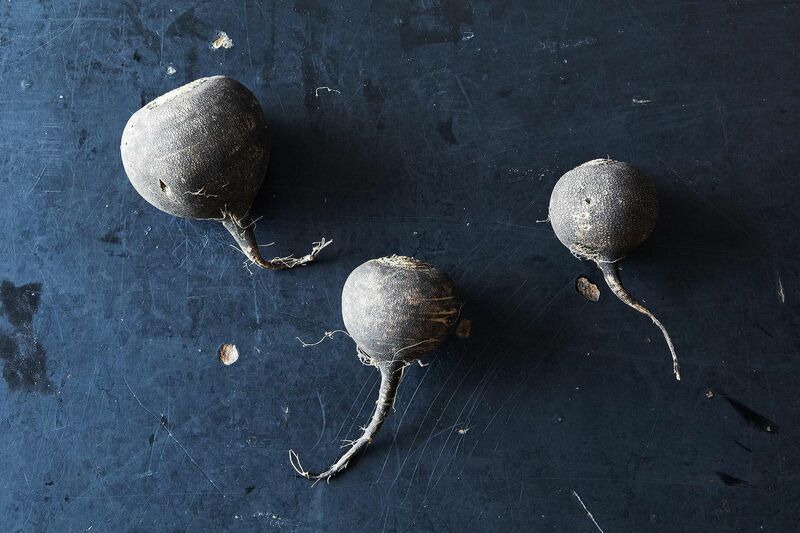 You might have already passed right by them, thinking they were especially deeply-colored or dirt-covered beets -- black radishes certainly aren’t as cheery as the pretty pink orbs you might be used to. They have coarse, charcoal-colored skin (1), and creamy white flesh (2) with a spicy bite. Select specimens that are firm, feel heavy for their size, and are free of cracks; they can be round like these, or more elongated. They store well, so don’t be surprised if you only find them without their greens attached. As for where to store them, Elizabeth Schneider says: “Nothing is better than a root cellar, where you can keep the radishes buried in earth.” What? You don’t have one?! (Us either.) Not to worry -- just wrap them in newspaper or perforated plastic in the refrigerator, and they’ll keep well for a long time even sans cellar. Keep it simple and roast black radishes with olive oil and salt. (Need a refresher? 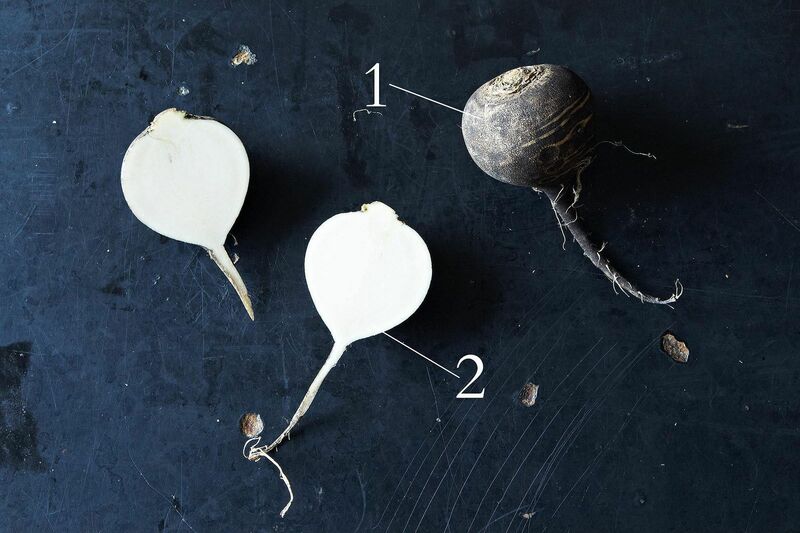 Here’s how to roast any vegetable in 4 steps.) Branch out and roast some grapes too, then fold them into lemony quinoa. Black radishes can also be roasted whole, and then peeled and mashed, or try slicing them thinly and turning them into radish chips. Yes, they’re pungent, so they probably aren’t the radishes that you want to take a big bite of after slathering with butter and sprinkling with salt, but that doesn’t mean you can’t enjoy them raw. Dice, slice, or shred them into a salad with celeriac, pomegranate, and pecorino; apples, lemon, and mint; or carrots, arugula, and thyme. If you’re worried that you won’t be able to handle the heat, salt the radishes before you use them to take the edge off, or try pickling them. What are your favorite ways to use black radishes? Tell us in the comments! Delicious, fresh from the garden of friend Dickie B in North Carolina. Peeled, shredded coarsely on box grater, salted a bit, julienne of red bell pepper and green onions (scallions), also fresh from the garden. The first time we had this, it was this simple slaw. The second time, this slaw topped a toasted cinn-raisin bagel thin smeared with a bit of cream cheese: my version of Black Radish Bruschetta. Tomorrow I'm planning to lightly saute the remaining slaw, and add a cube of cream cheese, and serve it hot. Has anyone tried flavors of curry with black radish? With my next black radishes I try might be raw again in a shredded slaw, but curried this time, and with raisins. Or that hot saute, with curry added. I dice them up small and throw them into a tuna salad with olives, tomatoes, herbs, and a dill feta mayo. I love them shaved thin in a salad, also I "pickle" them quickly for a nice addition to sandwiches. My roommate once found these in our CSA and assumed they were beets. She boiled and tried to peel them to make 'Herring Under a Fur Coat'. It did not turn out well. Not to hate on Shuba, but I think they're better thinly shaved in a raw, root vegetable salad. I grow a variety of Spanish black and have found that they hold up really well through hot summers. They don't go woody or bolt, allowing me to enjoy them long after the typical short/spring growing season of their pink & red cousins. Wow, I'm so inspired that pyramid builders were really our Not Sad Desk Lunch forefathers! I finally bought black radishes at the market this winter -- some sort of root-for-the-underdog that my father instilled in me -- and I really loved their bite. I also like how they stand up to a good sauté. Fascinating, right? I just can't believe such an important contribution to society hasn't been discussed at greater length.